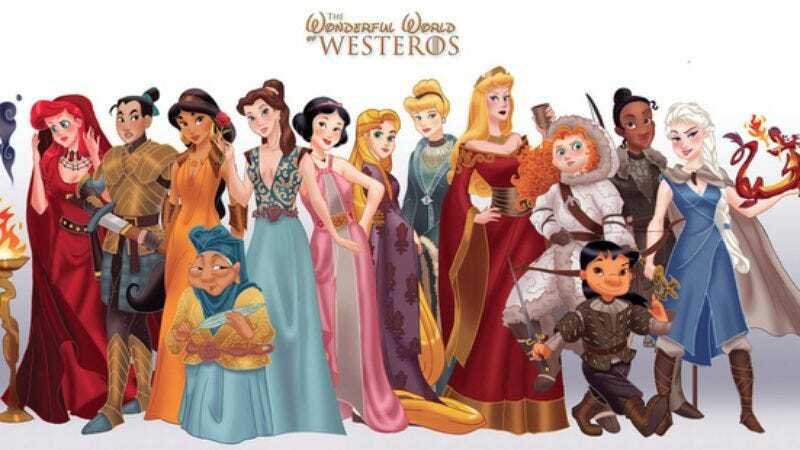 While Game Of Thrones is usually associated with graphic violence and “sexposition,” a deviantART user named DjeDjehuti has highlighted a softer side of the women of Westeroes by mashing them up with Disney princesses. Titled “The Wonderful World Of Westeros,” the series is part casting exercise and part art project. A few of our favorite portraits can be seen below and more are available at BuzzFeed. Some of the designs offer perfect pairings: Elsa as Daenerys Targaryen, Mulan as Brienne, Cinderella as Catelyn Stark. Others merely convey the right look: Aurora as Cersei Lannister, Ariel as Melisandre. The only slight misstep is probably Belle as Margaery Tyrell (she’s more of a Talisa). This now opens up a whole field of casting choices for the men as well. Prince Eric as Robb Stark? Phoebus as Jaime Lannister? Hercules as Khal Drogo? The possibilities are endless.